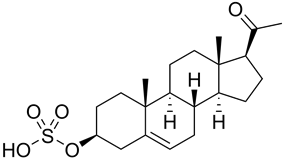 Pregnenolone sulfate (3β-hydroxypregn-5-en-20-one sulfate; abbreviated as PS) is an endogenous excitatory neurosteroid that is synthesized from pregnenolone. It is known to have cognitive and memory-enhancing, antidepressant, anxiogenic, and proconvulsant effects. Pregnenolone sulfate is a neurosteroid with excitatory effects in the brain, acting as a potent negative allosteric modulator of the GABAA receptor and a weak positive allosteric modulator of the NMDA receptor. To a lesser extent, it also acts as a negative allosteric modulator of the AMPA, kainate, and glycine receptors, and may interact with the nACh receptors as well. In addition to its effects on ligand-gated ion channels, pregnenolone sulfate is an agonist of the sigma receptor, as well as an activator of the TRPM1 and TRPM3 channels. It may also interact with potassium channels and voltage-gated sodium channels. ^ a b c d e Harteneck C (2013). "Pregnenolone sulfate: from steroid metabolite to TRP channel ligand". Molecules 18 (10): 12012–28. ^ a b c d Reddy DS (2010). "Neurosteroids: endogenous role in the human brain and therapeutic potentials". Prog. Brain Res. 186: 113–37. ^ Park-Chung M, Wu FS, Farb DH (July 1994). "3 alpha-Hydroxy-5 beta-pregnan-20-one sulfate: a negative modulator of the NMDA-induced current in cultured neurons". Mol. Pharmacol. 46 (1): 146–50. ^ Yaghoubi N, Malayev A, Russek SJ, Gibbs TT, Farb DH (August 1998). "Neurosteroid modulation of recombinant ionotropic glutamate receptors". Brain Res. 803 (1-2): 153–60.